WASHINGTON — Eric Béranger, former chief executive of satellite constellation venture OneWeb, has left the company entirely, OneWeb confirmed Oct. 15. “Eric has moved on to pursue new opportunities,” OneWeb spokesperson Katie Dowd said by email. Dowd did not respond to subsequent questions about his departure. Béranger, who was named OneWeb’s CEO in July 2016, was demoted last month to president and chief operating officer. During a panel at World Satellite Business Week in September, Béranger described being CEO of OneWeb as “a hell of a job,” between attending conferences, building the company and seeking to raise capital for the multi-billion dollar effort. Béranger was to split those responsibilities with the company’s new CEO Adrian Steckel, who joined from Uphold, a digital currency company he co-founded. Steckel is OneWeb’s fourth CEO in as many years. Béranger followed Matt O’Connell, the former president and CEO of GeoEye, as OneWeb’s CEO. Prior to O’Connell, OneWeb Founder Greg Wyler served as CEO of the internet satellite startup in 2015. 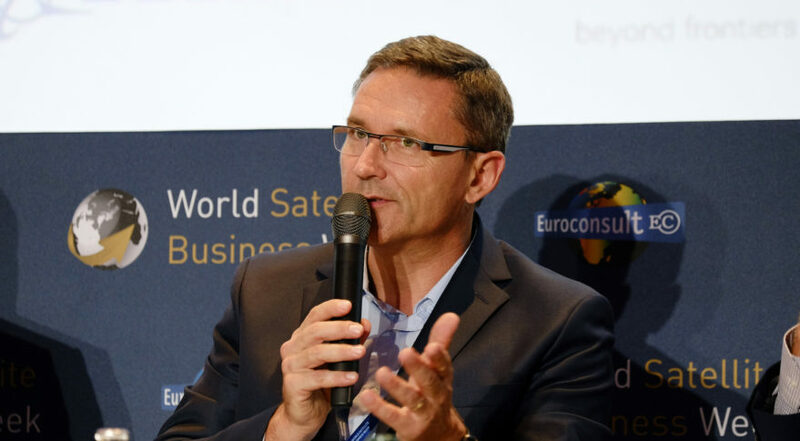 During the conference, Béranger avoided questions about the exact cost of the OneWeb constellation for which 900 satellites are under construction. OneWeb raised $1.7 billion from investors, of which $1 billion came from Japanese conglomerate Softbank, and has said it plans to meet the rest of its financing needs through borrowing. It has been almost two years since OneWeb announced any new capital, however.